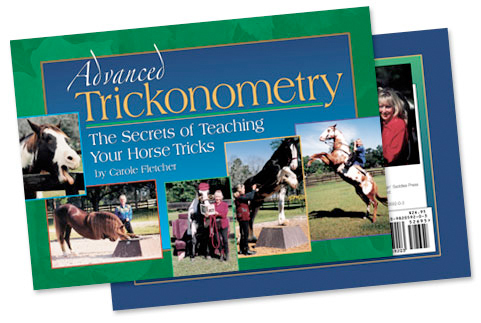 ADVANCED TRICKONOMETRY: The Secrets of Teaching Your Horse Tricks by Carole Fletcher, Singin' Saddles Press, 2008, Hardcover, 72 pages, $20.95. Looking for a wonderful gift for that horse lover, or even for yourself? Look no further. This book guarantees hours of fun with your horse, making him the superstar of the barn! Description: First-time ever (no kidding!) divulged instructions for sublimely fun and entertaining tricks and ways to present them to the public. Ever wonder how the movie horse trainers get their horse to limp on command? Or how the Budweiser Clydesdale gives a high-five to the dalmation in the TV commercial? The answers can be found in this book. Hardcover and wire-bound to lay flat when opened, this book is sturdy and convenient for use during training. Clear, well-illustrated step-by-step instructions for 29 innovative new tricks and high school movements anyone can put into practice. Examples include irresistibly witty tricks like: Yawning, Stick Out Your Tongue, Play Basketball, Limp on Command, High-Five, Sit Down Like a Dog as well as the more elegant Spanish Walk, Curtsy Bow on a Pedestal, Cross Legs and Pivot, Rear, Rhumba, Pivot with one Foreleg Extended and other Pedestal Poses (pedestal construction plans included). Need help presenting these tricks in a performance? In this book, Carole provides plenty of tips how. Whether you're looking to train a "one-trick" pony or a professional star performer (equine commercial model or actor), this one-of-a-kind book will make you and your horse smarter, shine with talent, more valuable and in demand. You might even need an agent!